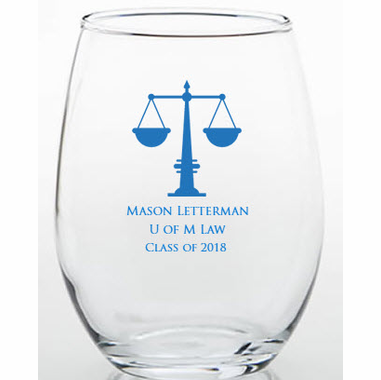 If you are looking for personalized law school graduation favors that are also keepsakes, these trinket holders are ideal. 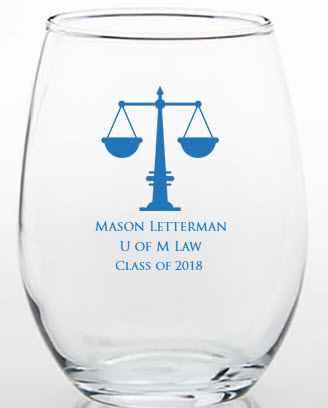 Also sold as stemless wine glasses, many guests use them to store small items in them. Locate the Scales of Justice for the perfect graphic and add your custom message. Each measures 3.75 inches tall and 2.5 inches in diameter, with a 9 ounce capacity and come bulk packed. I was under a time crunch to receive the glasses in time for my event and you all came through! I received the glasses when promised and they looked GREAT! Thank you so much! Ordered these as a take-away for upcoming class reunion. Glasses were much smaller than I expected but will work well for party favors.